Previous experience is not required, just an enthusiasm to savor the basics of fragrance design in a more intentional way. In this workshop we will gather at one table for three hours to make a deeper exploration into the nuances of creating perfumes with natural essences. Monique with facilitate a guided tour of fragrance construction and present an intuitive approach to design. Each guest will have the opportunity to create three modifications of their perfume, making for a richer experience and a better sense of how the art and science of perfumery with plants works. Working from the same curated palette, attendees have access to classic chypre (mossy) and amber bases created by Alchemy - plus beautiful heart notes and head accords - not sure what those words mean? That's okay! We're going to review common terms, discuss how to add sophistication with tinctures, how to evaluate, 'age' and filter perfumes. Everyone will take home three fragrance 'experiments' - and atomizer bottle for your favorite - a funnel for transferring the perfume - plus a booklet for more experimenting at home. 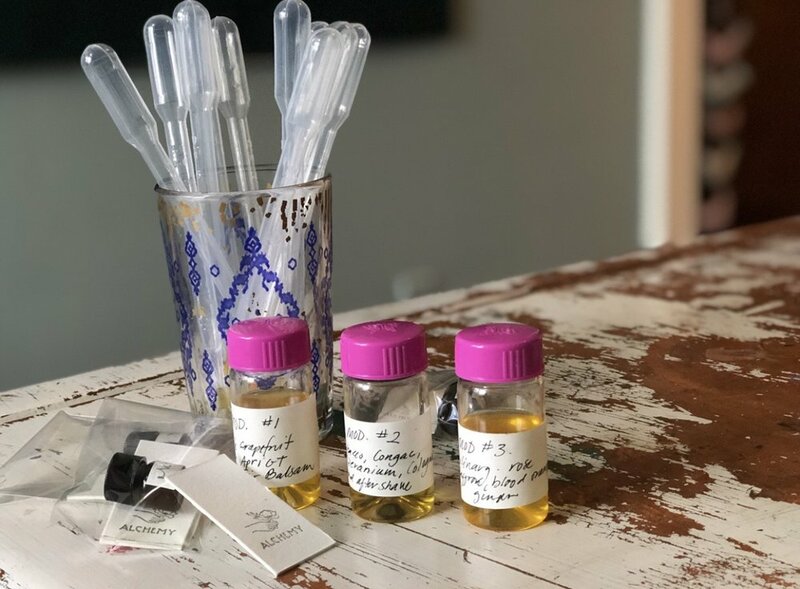 Borrowing the tools of aromatherapy and returning to the roots of natural perfumery - come explore natural perfume construction. This is an interactive, intuitive approach to scent construction that allows the guests to invoke a mood or memory through scent. When we talk about fragrance design we borrow the lyrical language of music... notes... accords. Fragrance, like music has the power to transport us to places real and imagined. Be ready to play with scent. Use pre-blended complex bits of fragrance, fresh single scents to create a blend for you or as a gift. Create your own natural perfume to take home. A beautiful perfume is a scent story with a beginning, middle and end. The middle, or heart is often constructed from flowers. Natural perfume borrows the materials of aromatherapy and the techniques of classic French perfumery. At the heart of a perfume, we find flowers - come create an exquisite and lasting bouquet. A beautiful perfume is a scent story with a beginning, middle and end. The middle, or heart is from the essence of flowers. Our Natural perfume workshop borrows the materials of aromatherapy and the techniques of classic French perfumery. Just in time for Valentine’s Day, this hands-on experience where guests will have the opportunity to create their own scent. Our interactive, intuitive approach to scent construction is fun! It allows guests to invoke a mood or memory through scent, while exploring the art and science of natural perfumery. We will be applying principles of perfumery to create a personal perfume. This is an interactive, intuitive approach to scent construction that allows the guests to invoke a mood or memory through scent. When we talk about fragrance design we borrow the lyrical language of music... notes... accords. Fragrance, like music has the power to transport us to places real and imagined. Be ready to play with scent. Create a natural fragrances to freshen up your spaces. Join Monique and learn about the magic of Alchemy. In this workshop we will play with plant based essences, learn the fundamentals of fragrance, discuss aromas and mood, begin to smell with our imagination, and then create a custom 1 oz mist to take home. Using plant essences we will create a mist suitable for room or body - we will also covers safety, sourcing and science of scent. Applying principles of perfumery to affect sense of space and wellness in design. This is an interactive, intuitive approach to scent construction that allows the guests to imagine a feeling to invoke through scent, and then create that mood. When we talk about fragrance we borrow the lyrical language of music... notes... accords. Fragrance, like music has the power to transport us to places real and imagined. Come ready to play with scent. Alchemy will provide all materials for blending a harmonious (synthetic-free) perfume. There will be a variety of scents, accords, bases and plant essences for constructing a perfume. Students will create their own 10ml atomizer mist to take home.